If the experience of the Third Reich teaches us anything, it is that a love of great music, great art and great literature does not provide people with any kind of moral or political immunization against violence, atrocity, or subservience to dictatorship. Bartrop, Paul R.; Jacobs, Leonard, eds. (2014). Modern Genocide: The Definitive Resource and Document Collection. 1. Santa Barbara, CA: ABC-CLIO. ISBN 978-1-61069-363-9. Beevor, Antony (2012). The Second World War. New York: Little, Brown. ISBN 978-0-316-02374-0. Berben, Paul (1975). 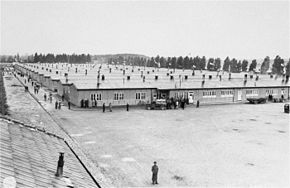 Dachau 1933–1945: The Official History. London: Norfolk Press. ISBN 978-0-85211-009-6. Berghahn, Volker R. (1999). 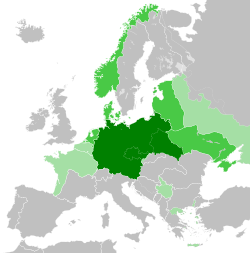 "Germans and Poles, 1871–1945". In Bullivant, Keith; Giles, Geoffrey; Pape, Walter (eds.). 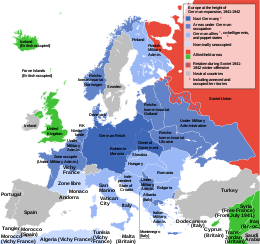 Germany and Eastern Europe: Cultural Identities and Cultural Differences. Yearbook of European Studies. Amsterdam; Atlanta, GA: Rodopi. ISBN 978-90-420-0688-1. Beyer, John C.; Schneider, Stephen A. "Forced Labour under the Third Reich – Part 1" (PDF). Nathan Associates. Archived from the original (PDF) on 9 May 2013. Retrieved 12 May 2013. Biddiscombe, Perry (2001). "Dangerous Liaisons: The Anti-Fraternization Movement in the US Occupation Zones of Germany and Austria, 1945–1948". Journal of Social History. 34 (3): 611–647. doi:10.1353/jsh.2001.0002. Boczek, Bolesław Adam (2005). International Law: A Dictionary. Lanham, MD: Scarecrow Press. ISBN 978-0-8108-5078-1. Bracher, Karl Dietrich (1970). The German Dictatorship. Translated by Steinberg, Jean. New York: Penguin Books. ISBN 978-0-14-013724-8. Browning, Christopher (2005). The Origins of the Final Solution: The Evolution of Nazi Jewish Policy, September 1939 – March 1942. UK: Arrow. ISBN 978-0-8032-5979-9. Bytwerk, Randall (1998). 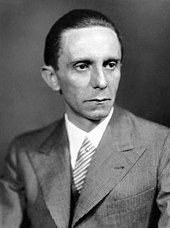 "German Propaganda Archive: Goebbels' 1943 Speech on Total War". Calvin College. Retrieved 3 March 2016. Clark, Christopher M. (2006). 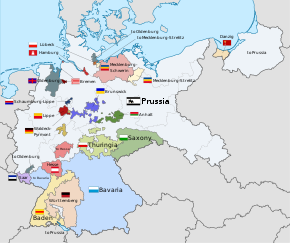 Iron Kingdom: The Rise and Downfall of Prussia, 1600–1947. London: Penguin Group. ISBN 978-0-674-02385-7. Closmann, Charles (2005). 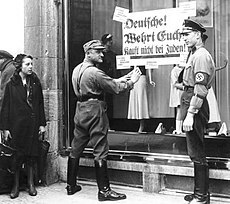 "Legalizing a Volksgemeinschaft: Nazi Germany's Reich Nature Protection Law of 1935". In Brüggemeier, Franz-Josef; Cioc, Mark; Zeller, Thomas (eds.). How Green Were the Nazis? : Nature, Environment, and Nation in the Third Reich. Athens: Ohio University Press. ISBN 978-0-8214-1646-4. Constable, George, ed. (1988). Fists of Steel. The Third Reich. Alexandria, VA: Time-Life Books. ISBN 978-0-8094-6966-6. Conway, John S (2001). The Nazi Persecution of the Churches, 1933–1945. Vancouver: Regent College Publishing. ISBN 978-1-57383-080-5. Cox, John M. (2009). 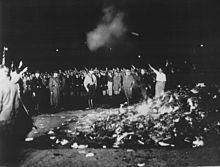 Circles of Resistance: Jewish, Leftist, and Youth Dissidence in Nazi Germany. New York: Peter Lang. ISBN 978-1-4331-0557-9. Cuomo, Glenn R. (1995). National Socialist Cultural Policy. New York: Palgrave MacMillan. ISBN 978-0-312-09094-4. Davies, Norman (2003). Rising '44: the Battle for Warsaw. New York: Viking. ISBN 978-0-670-03284-6. Davis, Richard G. (1995). "German Rail Yards and Cities: U.S. Bombing Policy 1944–1945". Air Power History. 42 (2): 46–63. "Declaration Regarding the Defeat of Germany and the Assumption of Supreme Authority with Respect to Germany and Supplementary Statements". American Journal of International Law. 39 (3): 171–178. July 1945. doi:10.2307/2213921. JSTOR 2213921. DeGregori, Thomas R. (2002). Bountiful Harvest: Technology, Food Safety, and the Environment. Washington: Cato Institute. ISBN 978-1-930865-31-0. DeLong, J. Bradford (February 1997). "Slouching Towards Utopia? : The Economic History of the Twentieth Century. XV. Nazis and Soviets". econ161.berkeley.edu. University of California at Berkeley. Archived from the original on 11 May 2008. Retrieved 21 April 2013. Dönitz, Karl (2012) . Memoirs: Ten Years and Twenty Days. London: Frontline. ISBN 978-1-84832-644-6. Douglas, R.M (2012). 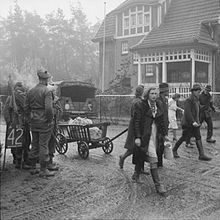 Orderly and Humane: The Expulsion of the Germans after the Second World War. New Haven: Yale University Press. ISBN 978-0-300-16660-6. Encyklopedia Powszechna PWN (in Polish). 3. Warsaw: Państwowe Wydawnictwo Naukowe. 2004. ISBN 978-83-01-14179-0. Ericksen, Robert P.; Heschel, Susannah (1999). Betrayal: German Churches and the Holocaust. Minneapolis: Augsberg Fortress. ISBN 978-0-8006-2931-1. ""Euthanasie" im Nationalsozialismus". Das Bundesarchiv (in German). Government of Germany. 2012. Archived from the original on 21 October 2013. Retrieved 19 May 2013. Evans, Richard J. (2009). Cosmopolitan Islanders: British Historians and the European Continent. Cambridge; New York: Cambridge University Press. ISBN 978-0-521-19998-8. Farago, Ladislas (1972) . German Psychological Warfare. International Propaganda and Communications. New York: Arno Press. ISBN 978-0-405-04747-3. Fest, Joachim (1996). 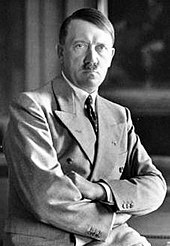 Plotting Hitler's Death: The German Resistance to Hitler 1933–1945. London: Weidenfeld & Nicolson. ISBN 978-0-297-81774-1. Fest, Joachim (1999). Speer: The Final Verdict. Translated by Osers, Ewald; Dring, Alexandra. San Diego: Harcourt. ISBN 978-0-15-100556-7. Fleming, Michael (Spring 2014). "Allied Knowledge of Auschwitz: A (Further) Challenge to the 'Elusiveness' Narrative". Holocaust and Genocide Studies. 28 (1): 31–57. doi:10.1093/hgs/dcu014. Freeman, Michael J. (1995). Atlas of Nazi Germany: A Political, Economic, and Social Anatomy of the Third Reich. London; New York: Longman. ISBN 978-0-582-23924-1. Friedländer, Saul (2009). Nazi Germany and the Jews, 1933–1945. New York: Harper Perennial. ISBN 978-0-06-135027-6. Germany (West) Presse- und Informationsamt (1961). Germany Reports. With an introduction by Konrad Adenauer (in German). Wiesbaden: F. Steiner. OCLC 5092689. Germany (West). Statistisches Bundesamt (1958). Die deutschen Vertreibungsverluste. 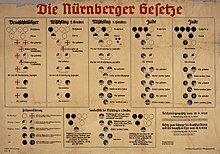 Bevölkerungsbilanzen für die deutschen Vertreibungsgebiete 1939/50 (in German). Wiesbaden: Verlag W. Kohlhammer. OCLC 7363969. Gill, Anton (1994). An Honourable Defeat: A History of the German Resistance to Hitler. London: Heinemann. Gill, Roger (2006). Theory and Practice of Leadership. London: SAGE Publications. ISBN 978-0-7619-7176-4. Glantz, David M. (1995). When Titans Clashed: How the Red Army Stopped Hitler. Lawrence, KS: University Press of Kansas. ISBN 978-0-7006-0899-7. Goebel, Nicole (28 September 2017). "Auschwitz-Birkenau: 4 out of 10 German students don't know what it was". Deutsche Welle. Archived from the original on 28 September 2017. Retrieved 16 February 2019. Goeschel, Christian (2009). Suicide in Nazi Germany. Oxford; New York: Oxford University Press. ISBN 978-0-19-953256-8. Grunberger, Richard (1971). 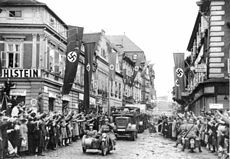 The 12-Year Reich: A Social History of Nazi Germany 1933–1945. New York: Holt Rinehart and Winston. ISBN 978-0-03-076435-6. Haar, Ingo (2009). Ehmer, Josef (ed.). Die deutschen Vertreibungsverluste: – Forschungsstand, Kontexte und Probleme. Ursprünge, Arten und Folgen des Konstrukts "Bevölkerung" vor, im und nach dem "Dritten Reich" : Aspekte und Erkenntnisse zur Geschichte der deutschen Bevölkerungswissenschaft (in German). Springer. ISBN 978-3-531-16152-5. Hahn, Hans Henning; Hahnova, Eva (2010). Die Vertreibung im deutschen Erinnern. Legenden, Mythos, Geschichte (in German). Munich; Vienna: Paderborn. ISBN 978-3-506-77044-8. Hamblet, Wendy C. (2008). 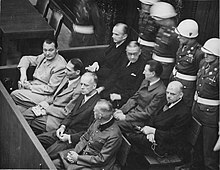 "Book Review: Götz Aly: Hitler's Beneficiaries: Plunder, Racial War, and the Nazi Welfare State". Genocide Studies and Prevention: An International Journal. 3 (2): 267–268. doi:10.3138/gsp.3.2.267 (inactive 8 February 2019). Retrieved 14 April 2017. Hanauske-Abel, Hartmut M. (7 December 1996). 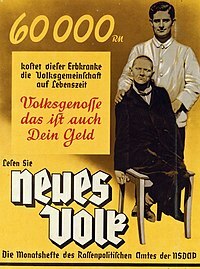 "Not a slippery slope or sudden subversion: German medicine and National Socialism in 1933" (PDF). BMJ. 313 (7070): 1453–1463. doi:10.1136/bmj.313.7070.1453. PMC 2352969. PMID 8973235. Harding, Thomas (23 August 2006). "Battle of Britain was won at sea. Discuss". The Telegraph. Retrieved 22 December 2017. 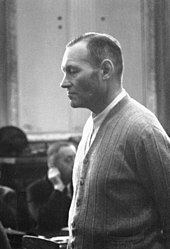 Richter, Heinz A. (1998). Greece in World War II (in Greek). transl by Kostas Sarropoulos. Athens: Govostis. ISBN 978-960-270-789-0. Hildebrand, Klaus (1984). The Third Reich. Boston: George Allen & Unwin. ISBN 978-0-04-943032-7. Hitchcock, William I. (2004). The Struggle for Europe: The Turbulent History of a Divided Continent, 1945 to the Present. New York: Anchor. ISBN 978-0-385-49799-2. Hoffmann, Peter (1988). German Resistance to Hitler. Cambridge; London: Harvard University Press. ISBN 978-0-674-35085-4. Hoffmann, Peter (1996) . The History of the German Resistance, 1933–1945. Montreal: McGill-Queen's University Press. ISBN 978-0-7735-1531-4. Hubert, Michael (1998). Deutschland im Wandel. Geschichte der deutschen Bevolkerung seit 1815 (in German). Stuttgart: Steiner, Franz Verlag. ISBN 978-3-515-07392-9. Kershaw, Ian (2000a). The Nazi Dictatorship: Problems and Perspectives of Interpretation (4th ed.). London: Arnold. ISBN 978-0-340-76028-4. Kershaw, Ian (2001) . 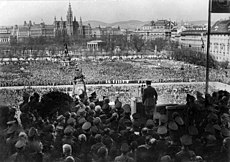 The "Hitler Myth": Image and Reality in the Third Reich. Oxford; New York: Oxford University Press. ISBN 978-0-19-280206-4. Kershaw, Ian (2011). The End: Hitler's Germany, 1944–45. London; New York: Penguin. ISBN 978-1-59420-314-5. "Kinobesuche in Deutschland 1925 bis 2004" (PDF) (in German). Spitzenorganisation der Filmwirtschaft e. V. Archived from the original (PDF) on 4 February 2012. Retrieved 10 May 2013. Klemperer, Klemens von (1992). German Resistance Against Hitler: The Search for Allies Abroad 1938-1945. Oxford University Press. ISBN 978-0-19-160679-3. Koldehoff, Stefan (29 November 2006). 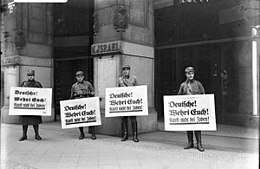 "Keine deutsche Opferarithmetik" (in German). Deutschlandfunk. Retrieved 29 May 2013. Koonz, Claudia (2003). The Nazi Conscience. Cambridge, MA: Belknap Press of Harvard University Press. ISBN 978-0-674-01172-4. Lakotta, Beate (March 2005). "Tief vergraben, nicht dran rühren". Der Spiegel (in German). No. 2. Hamburg: Spiegel-Verlag. pp. 218–221. Lauryssens, Stan (1999). The Man Who Invented the Third Reich: The Life and Times of Arthur Moeller van den Bruck. Stroud: Sutton. ISBN 978-0-7509-1866-4. Lewis, Brenda Ralph (2000). 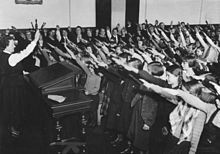 Hitler Youth: the Hitlerjugend in War and Peace 1933–1945. Osceola, WI: MBI. ISBN 978-0-7603-0946-9. Majer, Diemut (2003). "Non-Germans" under the Third Reich: The Nazi Judicial and Administrative System in Germany and Occupied Eastern Europe, with Special Regard to Occupied Poland, 1939–1945. Baltimore; London: Johns Hopkins University Press. ISBN 978-0-8018-6493-3. Marcuse, Harold (2001). Legacies of Dachau: The Uses and Abuses of a Concentration Camp, 1933-2001. Cambridge; New York: Cambridge University Press. ISBN 978-0-521-55204-2. Martin, Bernd (2005) . Japan and Germany in the Modern World. New York; Oxford: Berghahn Books. ISBN 978-1-84545-047-2. Materski, Wojciech; Szarota, Tomasz (2009). Polska 1939–1945: straty osobowe i ofiary represji pod dwiema okupacjami (in Polish). Instytut Pamięci Narodowej, Komisja Ścigania Zbrodni przeciwko Narodowi Polskiemu. ISBN 978-83-7629-067-6. McElligott, Anthony; Kirk, Tim; Kershaw, Ian (2003). Working Towards the Führer: Essays in Honour of Sir Ian Kershaw. Manchester: Manchester University Press. ISBN 978-0-7190-6732-7. Melvin, Mungo (2010). Manstein: Hitler's Greatest General. London: Weidenfeld & Nicolson. ISBN 978-0-297-84561-4. Nakosteen, Mehdi Khan (1965). The History and Philosophy of Education. New York: Ronald Press. OCLC 175403. "NS-Zwangsarbeit: "Verbotener Umgang"" (in German). 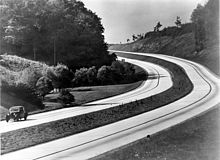 Stadtarchiv Göttingen Cordula Tollmien Projekt NS-Zwangsarbeiter. 1942. Nicholas, Lynn H. (2006). Cruel World: The Children of Europe in the Nazi Web. New York: Vintage. ISBN 978-0-679-77663-5. "NS-Frauenwarte: Paper of the National Socialist Women's League". Heidelberg University Library. Retrieved 8 May 2013. Oberkommandos der Wehrmacht (1941). Soldaten Atlas (in German). 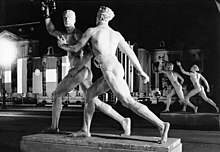 Overmans, Rüdiger (2000) . Deutsche militärische Verluste im Zweiten Weltkrieg. Beiträge zur Militärgeschichte (in German). München: R. Oldenbourg. ISBN 978-3-486-56531-7. Overmans, Rűdiger (1994). "Personelle Verluste der deutschen Bevölkerung durch Flucht und Vertreibung". Dzieje Najnowsze Rocznik. 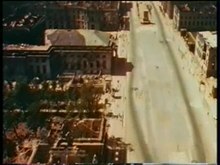 16: 51–63. Overy, Richard (2005) . The Dictators: Hitler's Germany, Stalin's Russia. UK: Penguin Group. ISBN 978-0-393-02030-4. Overy, Richard (2006) . Why The Allies Won. London: Random House. ISBN 978-1-84595-065-1. Overy, Richard (2014). The Bombers and the Bombed: Allied Air War Over Europe 1940–1945. New York: Viking. ISBN 978-0-698-15138-3. Panayi, Panikos (2005). 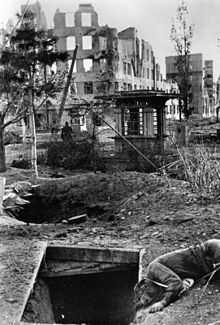 "Exploitation, Criminality, Resistance: The Everyday Life of Foreign Workers and Prisoners of War in the German Town of Osnabruck, 1939–49". Journal of Contemporary History. 40 (3): 483–502. doi:10.1177/0022009405054568. JSTOR 30036339. Pauley, Bruce F. (2003) . Hitler, Stalin, and Mussolini: Totalitarianism in the Twentieth Century. European History Series. Wheeling, IL: Harlan Davidson. ISBN 978-0-88295-993-1. Pilisuk, Marc; Rountree, Jennifer Achord (2008). Who Benefits from Global Violence and War: Uncovering a Destructive System. Westport, CT: Praeger Security International. ISBN 978-0-275-99435-8. Pine, Lisa (2011) . Education in Nazi Germany. Oxford; New York: Berg. ISBN 978-1-84520-265-1. Posener, Alan (9 April 2018). "German TV Is Sanitizing History". Foreign Policy. Retrieved 16 February 2019. Proctor, Robert N. (1999). The Nazi War on Cancer. Princeton, NJ: Princeton University Press. ISBN 978-0-691-07051-3. "Refugees: Save Us! Save Us!". Time. 9 July 1979. Archived from the original on 24 April 2011. Retrieved 28 April 2013. Raeder, Erich (2001) . Grand Admiral: The Personal Memoir of the Commander in Chief of the German Navy From 1935 Until His Final Break With Hitler in 1943. New York: Da Capo Press. ISBN 978-0-306-80962-0. Rees, Laurence (2005). Auschwitz: A New History. New York: Public Affairs, member of Perseus Books Group. ISBN 978-1-58648-303-6. Rhodes, Richard (2002). 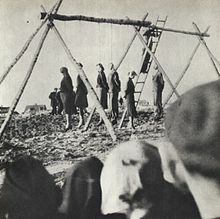 Masters of Death: The SS-Einsatzgruppen and the Invention of the Holocaust. New York: Vintage Books. ISBN 978-0-375-70822-0. Rupp, Leila J. (1978). 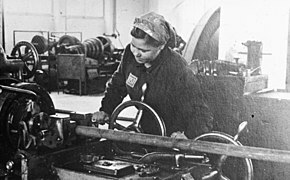 Mobilizing Women for War: German and American Propaganda, 1939–1945. Princeton, N.J.: Princeton University Press. ISBN 978-0-691-04649-5. OCLC 3379930. Scobie, Alexander (1990). 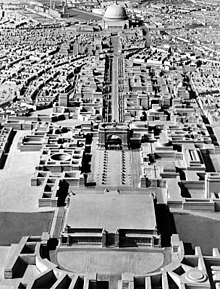 Hitler's State Architecture: The Impact of Classical Antiquity. University Park: Pennsylvania State University Press. ISBN 978-0-271-00691-8. Sereny, Gitta (November 1999). "Stolen Children". Talk. Retrieved 1 July 2012. Smith, J. W. (1994). The World's Wasted Wealth 2: Save Our Wealth, Save Our Environment. Cambria, CA: Institute for Economic Democracy. ISBN 978-0-9624423-2-2. Smith, Joseph; Davis, Simon (2005). The A to Z of the Cold War. Lanham, MD: Scarecrow Press. ISBN 978-0-8108-5384-3. Spotts, Frederic (2002). Hitler and the Power of Aesthetics. New York: Overlook Press. ISBN 978-1-58567-345-2. Staff (16 December 2015). "What the Führer means for Germans today". The Economist. Retrieved 24 September 2018. "Statistisches Jahrbuch für die Bundesrepublik Deutschland" (PDF) (in German). Statistisches Bundesamt. 2006. p. 34. Archived from the original (PDF) on 26 September 2007. Retrieved 17 March 2012. Stein, George (2002) . 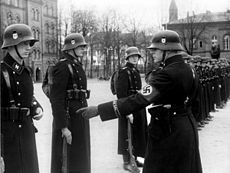 The Waffen-SS: Hitler's Elite Guard at War 1939–1945. Cerberus Publishing. ISBN 978-1-84145-100-8. Steiner, Zara (2011). The Triumph of the Dark: European International History 1933–1939. Oxford; New York: Oxford University Press. ISBN 978-0-19-921200-2. Stephenson, Jill (2001). Women in Nazi Germany. London: Longman. ISBN 978-0-582-41836-3. Stolfi, Russel (March 1982). "Barbarossa Revisited: A Critical Reappraisal of the Opening Stages of the Russo-German Campaign (June–December 1941)". Journal of Modern History. 54 (1): 27–46. doi:10.1086/244076. hdl:10945/44218. Tomasevich, Jozo (1975). War and Revolution in Yugoslavia, 1941–1945: The Chetniks. Stanford, CA: Stanford University Press. ISBN 978-0-8047-0857-9. Tooze, Adam (2006). The Wages of Destruction: The Making and Breaking of the Nazi Economy. New York; Toronto: Viking. ISBN 978-0-670-03826-8. Tümmler, Holger (2010). Hitlers Deutschland: Die Mächtigen des Dritten Reiches (in German). Wolfenbüttel: Melchior Verlag. ISBN 978-3-941555-88-4. Uekötter, Frank (2006). 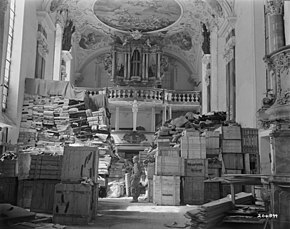 The Green and the Brown: A History of Conservation in Nazi Germany. Cambridge; New York: Cambridge University Press. ISBN 978-0-521-84819-0. Uekötter, Frank (2005). "Polycentrism in Full Swing: Air Pollution Control in Nazi Germany". In Brüggemeier, Franz-Josef; Cioc, Mark; Zeller, Thomas (eds.). 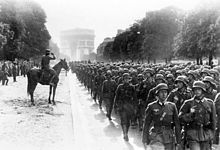 How Green Were the Nazis? 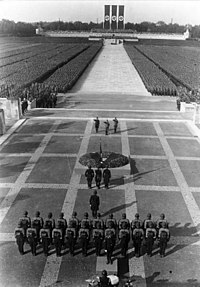 : Nature, Environment, and Nation in the Third Reich. Athens: Ohio University Press. Umbreit, Hans (2003). "Hitler's Europe: The German Sphere of Power". In Kroener, Bernhard; Müller, Rolf-Dieter; Umbreit, Hans (eds.). Germany and the Second World War, Vol. 5. Organization and Mobilization in the German Sphere of Power. Part 2: Wartime Administration, Economy, and Manpower Resources, 1942–1944/5. Oxford; New York: Oxford University Press. ISBN 978-0-19-820873-0. USHMM. "Children during the Holocaust". United States Holocaust Memorial Museum—Holocaust Encyclopedia. Retrieved 24 April 2013. USHMM. "Dachau". United States Holocaust Memorial Museum—Holocaust Encyclopedia. Retrieved 14 July 2013. USHMM. "Genocide of European Roma (Gypsies), 1939–1945". United States Holocaust Memorial Museum—Holocaust Encyclopedia. Retrieved 16 September 2018. USHMM. 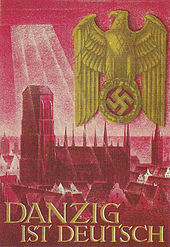 "The German Churches and the Nazi State". United States Holocaust Memorial Museum—Holocaust Encyclopedia. Retrieved 25 September 2016. USHMM. 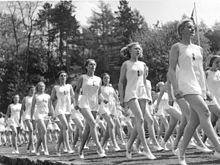 "Women in the Third Reich". United States Holocaust Memorial Museum—Holocaust Encyclopedia. Retrieved 19 August 2017. Weale, Adrian (2012) . Army of Evil: A History of the SS. New York; Toronto: NAL Caliber (Penguin Group). ISBN 978-0-451-23791-0. Wegner, Bernd (1990). The Waffen-SS: Organization, Ideology and Function. Hoboken, NJ: Blackwell. ISBN 978-0-631-14073-3. Weinberg, Gerhard L. (2010) . Hitler's Foreign Policy 1933–1939: The Road to World War II. New York: Enigma Books. ISBN 978-1-929631-91-9. Weinberg, Gerhard L. (2005) . A World at Arms: A Global History of World War II. Cambridge; Oxford: Cambridge University Press. ISBN 978-0-521-85316-3. Wiederschein, Harald (21 July 2015). "Mythos Waffen-SS". Focus (in German). Retrieved 3 October 2018. Wrobel, Peter (1999). "The Devil's Playground: Poland in World War II". The Canadian Foundation for Polish Studies of the Polish Institute of Arts & Sciences Price-Patterson Ltd.